xmas biscuits, originally uploaded by Seligman's Dog. Finished product of Sunday morning biscuits. Compliments of Frankie. Biscuits are an intriguing part of my repertoire. Everyone who bakes, makes biscuits. But, they are deceptively simple. Flour, baking powder, salt, some fat and milk, more or less. These particular biscuits started out like most others I do. 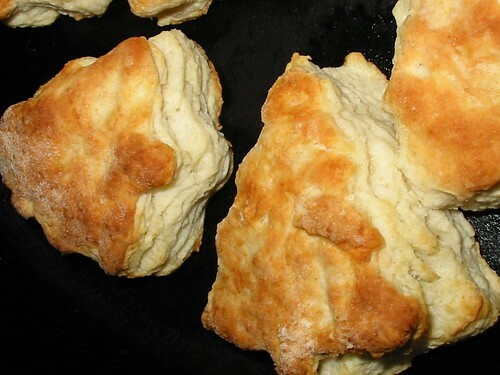 I usually make a slack batter and from that drop biscuits. Today, because we wanted to do something a bit more fun, I wanted to make a slightly drier dough, knead it a tad and cut out the biscuits. So, I took 2 cups of self rise flour (flour, leavening and salt together), cut in about 4T butter and poured in about 3/4 C milk while a cast iron skillet warmed up in a 450-deg-F oven. I fold in the milk until a shaggy mass formed. I flopped the mass onto the counter top and began folding it in half, not quite kneading. Then, Frankie pushed it out into a squat 6-8" disc. From that, she cut out her shapes. Christmas trees and a gingerbread boy. I separated the dough shapes and placed them in the blazing hot skillet (NOT greased) and baked it for about 15 minutes. Mrs. DavesBeer told me cutting them with a sharp cutter, like a cookie cutter makes for a good oven spring. She was right. These were high and the texture was flaky and layered. They were amazing. I think these will be our preferred biscuit instead of the drop version. Food always tastes better when made with your family, doesn't it? I am always baking something and love when my son jumps in to help. Hey CBM, It was an added blast to do the same old biscuit routine with a twist that she went nuts over. She's so into xmas. I was dangerously close to losing my grinch character. It's a lot of fun cooking with her.